A combination of two boosters and a switchable buffer. The boosters are based on the BJF Little Red Trebler and Red Rooster Booster, connected in that order and with a master volume control. You can use the pedal as a treble booster, a clean boost or an overdrive unit or any combination of the above. Also, it can be used with or without the buffer. CONTROLS MASTER: This is a volume control that is located directly after the booster circuit and when set to max it is just a resistor to ground. This control sets the final output and it can be used to control the output when the pedal is used for overdrive (Boost turned up). TREBLE: Set treble boost from zero to about 15dB. The treble frequency and bandwidth are carefully tuned with an optimized bass slope. BOOST: The gain of the booster and can be set from unity to about 40dB of boost. When this control is cranked the unit will distort within itself. BUFFER: Inside the pedal, there is a switch for a high-quality buffer. You can set the pedal for true bypass mode or “buffer on” in bypass mode. We recommend using a buffer in your signal chain to help with the treble and gain loss from using many pedals and/or long cables. Pedals are shipped “buffer on”.The Mad Professor RRB Buffer is an amplifier with a voltage gain of exactly 1x (times). The RRB buffer output impedance is set a little lower than the Dc resistance of a standard guitar pickup to equalize the effect of following load impedance. Input impedance is set at 500K for a medium load to standard guitar pickups. This keeps the tone and guitar volume taper natural. SETTINGS TREBLE BOOST: Set Boost to minimum and Master to maximum and adjust for a desired treble boost with the Treble knob. 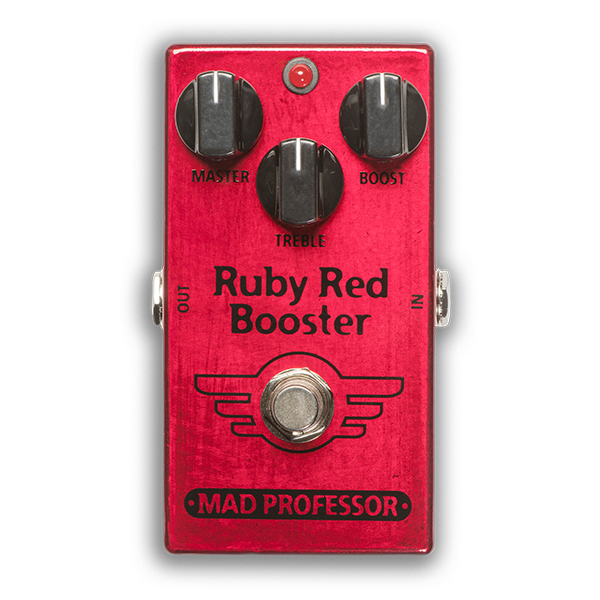 STRAIGHT BOOST: Set Treble to minimum and Master to maximum and adjust Boost to the desired effect. BOOST: The gain of the booster and can be set from unity to about 40dB of boost. When this control is cranked the unit will distort within itself. DISTORTION: Set Boost to maximum and adjust output level with Master to unity, then adjust Boost for desired depth and overdrive. Treble can be used to enhance distortion effect. CAUTION ! Never operate the unit with its bottom removed or damage will most likely occur. ELECTRICAL SPECIFICATIONS Input impedance: 500K Ohm’s Recommended output load: 50K Ohm’s or higher, effects output and buffer output Current consumption: 6mA at 9VDC DC supply voltage range: 8-18V Voltage gain: +40dB Treble boost: peak +15dB@4KHz Signal to noise ratio: 110 dB Effect 3dB bandwidth: 70Hz to 7KHz True bypass or buffered (switchable inside the pedal) POWER REQUIREMENTS 6F22 9V battery or DC eliminator 2.1 mm plug center negative and positive sleeve. NOTES RRB is protected against wrong DC eliminator polarity. The fuzzy sound is a sign of low voltage. Maintain recommended voltage for best results.